International Bacon Day is a special holiday for all people, who love bacon and dishes with it. Annually celebrated on the Saturday before Labor Day, this is one of the most popular unofficial holidays in the USA. Bacon Day was started in 2000 by a group of students Alexa Haflord, Seth Rittenhouse and Evan Salim from Bedford, Massachusetts. They decided that bacon was so delicious, that it deserved its own holiday. 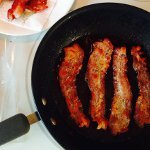 The students soon organized the first celebration of Bacon Day and started a blog to promote the holiday. Just in a couple of years event became very popular across the United States and participants of annual celebration enjoy bacon for breakfast, lunch and dinner. How can you celebrate International Bacon Day? The most common way is to throw a party. The most important part here is to cook and eat bacon. You can also ask your friends to bring any dish with bacon, thus you will expand your idea about the use of bacon in cooking. Those who are not afraid of crazy experiments may try adding bacon to ice cream or cookies. Who knows, may be you will find a new flavor, that will drive everyone crazy. By the way, International Bacon Day is a special holiday for everyone, even vegetarians, who may join the event and enjoy soy bacon. Religious objectors can have fun with non-pork bacon.